Hutchens to Discuss Orange County Law Enforcement Challenges and Opportunities. 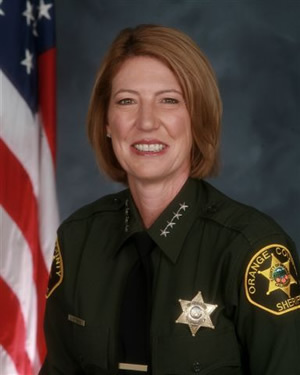 The Rotary Club of Coto de Caza & Rancho Santa Margarita announced that Orange County Sheriff Sandra Hutchens will speak at its meeting on Thursday, May 1 at 7 am. at the Tijeras Creek Golf Club in Rancho Santa Margarita, Calif.
Hutchens’ 30 year career in law enforcement includes counterterrorism training in Israel, FBI National Academy training, participation in the National Preparedness Leadership Initiative Program at Harvard University, and a Bachelor of Science degree in Public Administration from the University of La Verne. In her six years as Sheriff of Orange County, Hutchens has made numerous changes to the Orange County Sheriff’s Department with the goal of restoring the department’s core values and making crucial shifts to ensure citizen safety. The meeting includes breakfast and is open to all members of the Rancho Santa Margarita Coto de Caza community. Tickets are $15 and reservations can be made through Karen Hume via email at karenhume@att.net. Payment will also be accepted at the door on the day of the event. The Rotary Club of Coto de Caza & Rancho Santa Margarita announced that Orange County Sheriff Sandra Hutchens will speak at its meeting on Thursday, May 1 at 7 am. at the Tijeras Creek Golf Club in Rancho Santa Margarita, Calif. Hutchens, who became Sheriff in 2008, will discuss the state of the department, current state of law enforcement in Orange County, special challenges the department faces, and issues unique to the RSM and Coto areas. Hutchens is on the front line keeping our families safe, and we are grateful that she is sharing her breadth of knowledge about law enforcement in Orange County to answer questions that people might have, said Derek Godfrey, president of the Rotary Club of Coto de Caza Rancho Santa Margarita. ‘This is a great chance for both members and non-members to learn about issues that directly affect the safety of our communities.” Hutchens’ 30 year career in law enforcement includes counterterrorism training in Israel, FBI National Academy training, participation in the National Preparedness Leadership Initiative Program at Harvard University, and a Bachelor of Science degree in Public Administration from the University of La Verne. In her six years as Sheriff of Orange County, Hutchens has made numerous changes to the Orange County Sheriff’s Department with the goal of restoring the department’s core values and making crucial shifts to ensure citizen safety. The meeting includes breakfast and is open to all members of the Rancho Santa Margarita Coto de Caza community. Tickets are $15 and reservations can be made through Karen Hume via email at karenhume@att.net. Payment will also be accepted at the door on the day of the event.